The Eagle Nebula, also known as the Star Queen Nebula, Messier 16 (M16), and NGC 6611, is a star forming region located in Serpens. 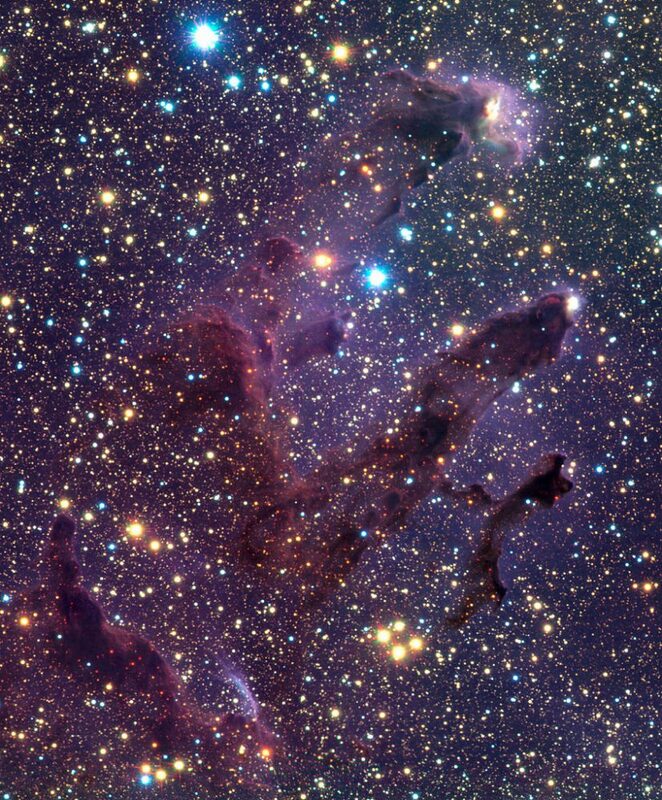 It is a well-known emission nebula surrounding a young open star cluster. The cluster associated with the nebula consists of a number of young stars belonging to the spectral classes O and B.
Messier 16 is best known for the famous Pillars of Creation, a region where intense star forming activity is taking place. The region was imaged by the Hubble Space Telescope in the 1990s. The Eagle Nebula in fact contains several active starburst regions. 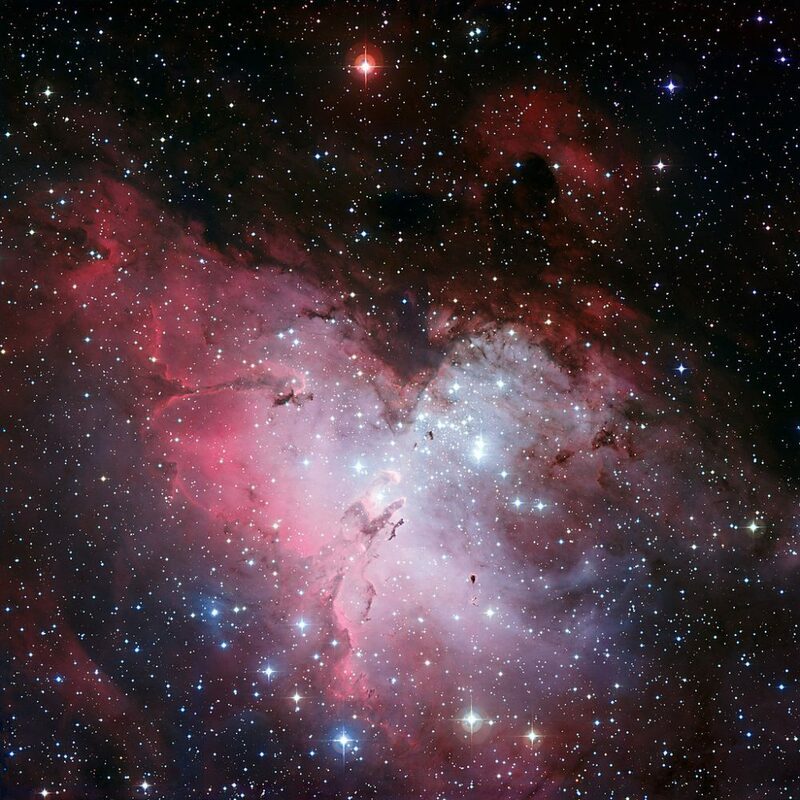 The Eagle Nebula was named for its shape, which resembles that of an eagle. It is part of a larger H II region designated as IC 4703, which is a diffuse emission nebula approximately 7,000 light years from Earth. Messier 16 can be seen in binoculars and amateur telescopes, which reveal about 20 stars and some of the surrounding nebulosity. The three pillars require extremely good observing conditions. The Eagle Nebula and the open cluster are best observed with low-powered telescopes. The star cluster associated with the Eagle Nebula was originally discovered by the Swiss astronomer Philippe Loys de Chéseaux in 1745-46. He observed the cluster, but did not see the surrounding nebula. 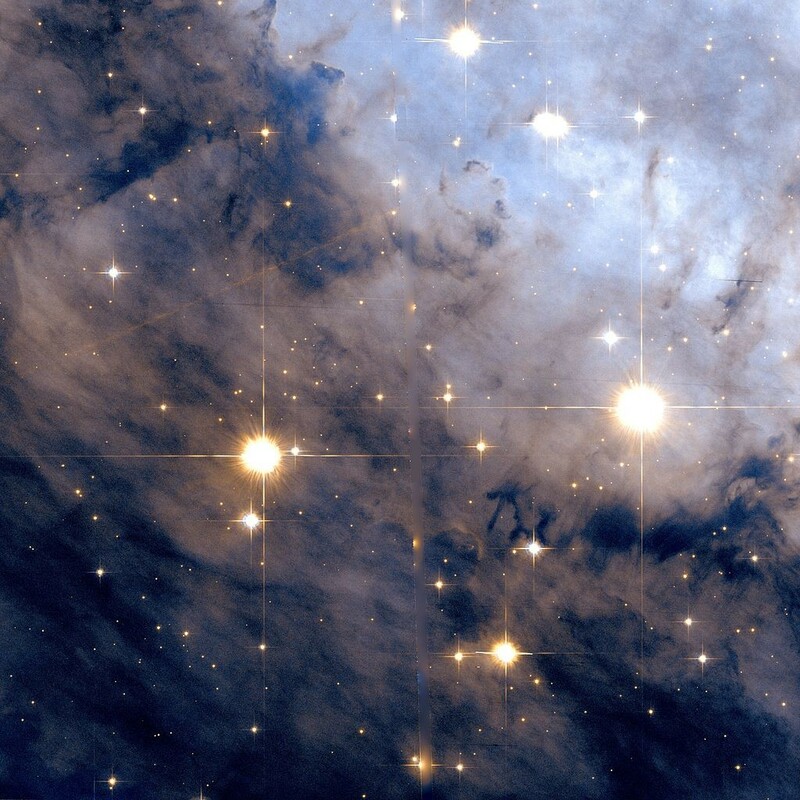 Charles Messier was the first to discover the nebulosity associated with the open cluster in June 1764. Messier included the nebula in his catalogue as the 16th object on the list, and it remains known as Messier 16. The nebula was added to the IC II of 1908 as IC 4703, and is often referred to by that designation, while the open cluster is referred to as NGC 6611. The Eagle Nebula is illuminated by the ultraviolet light of the young stars newly formed in one of the nebula’s star forming regions. The hot, young stars within the nebula also emit strong X-ray radiation. The nebula has an estimated mass of more than 12,000 solar masses. HD 168076, the brightest star in the Eagle Nebula, is a binary system consisting of an O3.5V star and an O7.5V companion. The star system has a visual magnitude of 8.24 and can be seen in good binoculars. The young open cluster associated with Messier 16 consists of about 460 stars. The brightest members of the cluster belong to the spectral class O. They are extremely massive, luminous stars, and can be up to a million times brighter than the Sun. The age of the cluster is believed to be 1-2 million years. 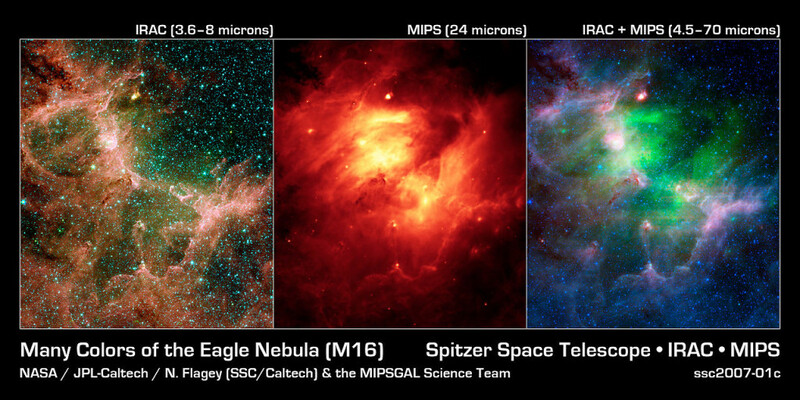 The other name for M16, the Star Queen Nebula, was introduced by the American astronomer Robert Burnham, Jr. Burnham gave it this name because he thought the central pillar in the nebula looked like the Star Queen shown in silhouette. 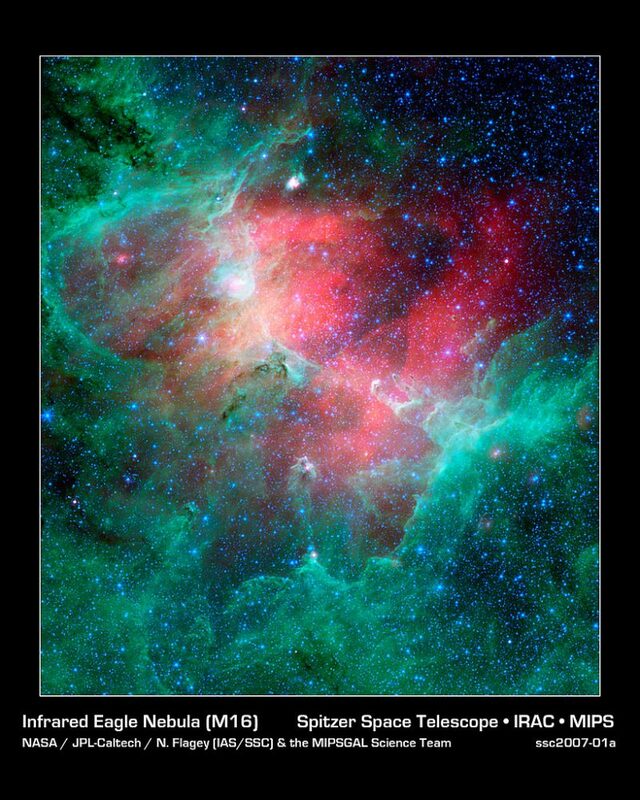 The Eagle Nebula was first imaged way back in 1895 by the American astronomer Edward Barnard. Isaac Roberts photographed it in 1897, after which the object was added to the IC catalogue. The Eagle Nebula stretches across an area about 70 by 55 light years in size. It lies at a distance of 7,000 light years from Earth. The nebula lies in the Sagittarius-Carina Arm, the inner spiral arm of our galaxy, the Milky Way, next to our own arm. M16 can be found by first locating the Teapot asterism in Sagittarius constellation, and then by following the line from the star Kaus Australis (Epsilon Sagittarii), the brightest star in Sagittarius, to just east of Kaus Media (Delta Sagittarii). Another way to find the nebula is by extending a line from Lambda Scuti in Scutum constellation to Alpha Scuti, and then to the south to Gamma Scuti. When observed through binoculars, the Eagle Nebula can be seen in the same field as the Omega Nebula (Messier 17) in Sagittarius. This region of the sky contains several other notable deep sky objects, including Messier 22 (Sagittarius Cluster), Messier 28, Messier 8 (Lagoon Nebula), Messier 20 (Trifid Nebula), Messier 21, Messier 23, the Sagittarius Star Cloud (Messier 24), Messier 25, and Messier 18. In good viewing conditions, the open cluster in M16 is easy to find, but to see the surrounding nebulosity well, one needs a large aperture telescope. The best time to observe the Eagle Nebula from the northern hemisphere is summer and early autumn, when the nebula can be found in the southern sky in the evening. The region known as the Pillars of Creation became famous in 1995, when it was imaged by Jeff Hester and Paul Scowen using the Hubble Space Telescope. It is one of the star forming regions within the Eagle Nebula. 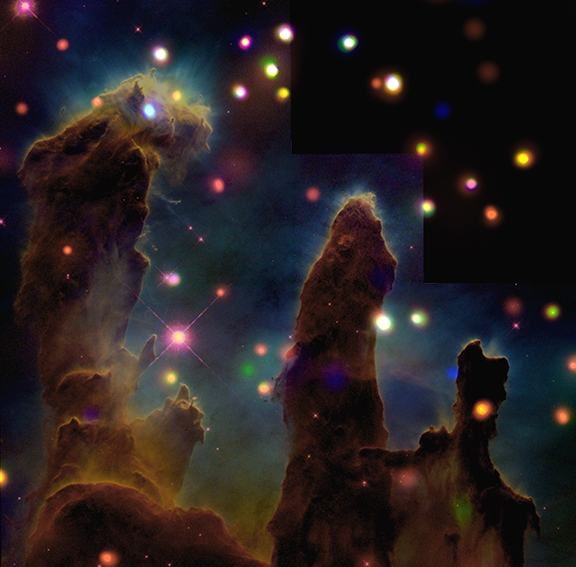 The pillars stretch across an area of approximately four light years and are illuminated by the light of newly formed stars. The pillars region is similar to the larger Soul Nebula, located in Cassiopeia constellation, which was nicknamed the Pillars of Star Formation. 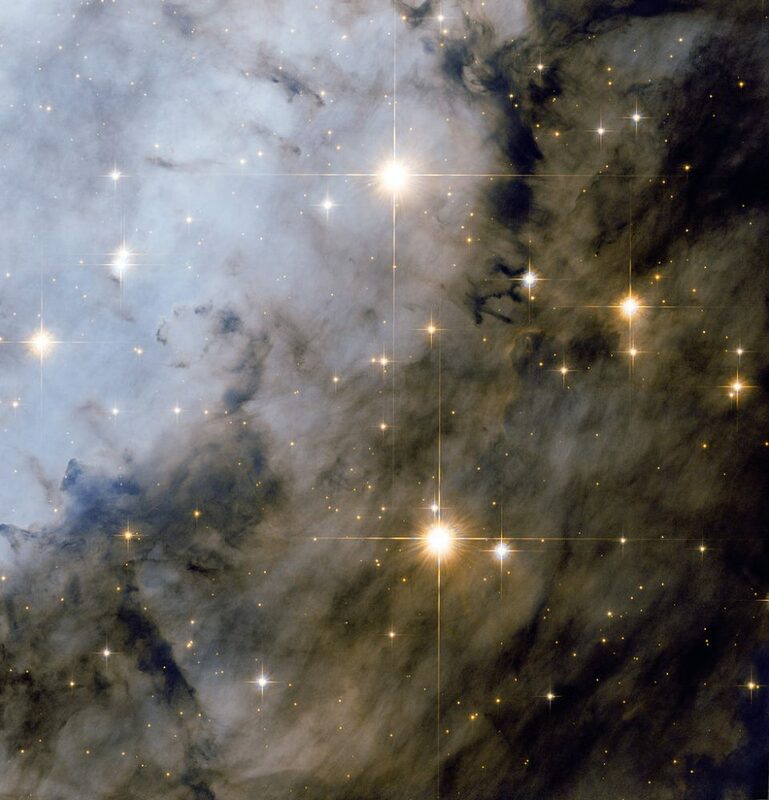 The region consists of columns of interstellar dust and hydrogen gas within which new stars are formed. The dense pockets of gas seen at the top of the pillars are called EGGs, or evaporating gaseous globules, and last for about 10,000-20,000 years. Those that contain enough gas will eventually collapse to form new stars. 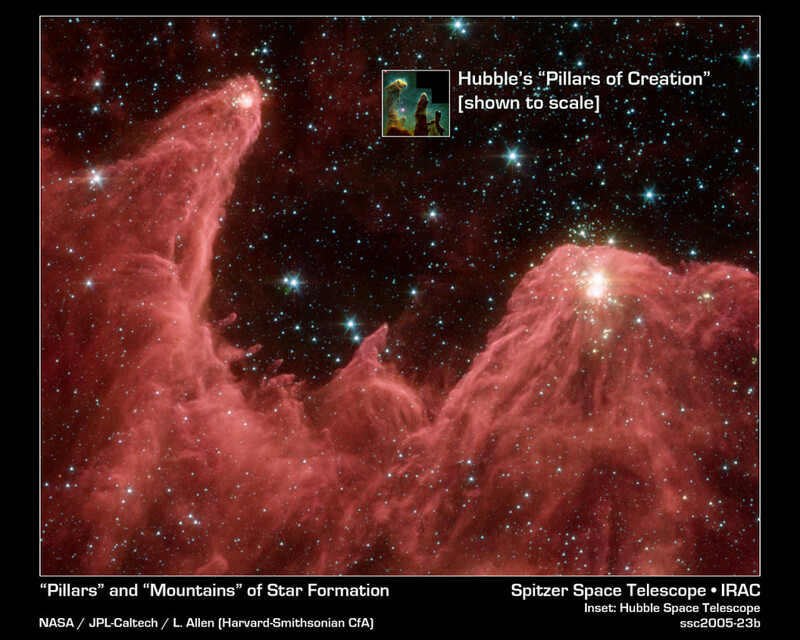 Images obtained from the Spitzer Space Telescope in 2007 indicate that the pillars may have been destroyed as a result of a supernova explosion in the vicinity, but the light showing the result of the supernova will not reach us for another 1,000 years. The supernova event is believed to have occurred about 8,000 to 9,000 years ago. The shock wave from the explosion would have taken a few millennia to move through the region, and the nebula is 7,000 light years distant from Earth, which means that we are seeing it as it appeared 7,000 years ago. The area where the supernova exploded is full of young, very massive stars that are also ready to explode. The NASA/ESA Hubble Space Telescope has once more turned its attention towards the magnificent Eagle Nebula (Messier 16). This picture shows the northwestern part of the region, well away from the centre, and features some very bright young stars that formed from the same cloud of material. These energetic toddlers are part of an open cluster and emit ultraviolet radiation that causes the surrounding nebula to glow. The star cluster is very bright and was discovered in the mid-eighteenth century. The nebula, however, is much more elusive and it took almost a further two decades for it to be first noted by Charles Messier in 1764. Although it is commonly known as the Eagle Nebula, its official designation is Messier 16 and the cluster is also named NGC 6611. One spectacular area of the nebula (outside the field of view) has been nicknamed “The Pillars of Creation” ever since the Hubble Space Telescope captured an iconic image of dramatic pillars of star-forming gas and dust. The cluster and nebula are fascinating targets for small and medium-sized telescopes, particularly from a dark site free from light pollution. Messier 16 can be found within the constellation of Serpens Cauda (the Tail of the Serpent), which is sandwiched between Aquila, Sagittarius, and Ophiuchus in the heart of one of the brightest parts of the Milky Way. Small telescopes with low power are useful for observing large, but faint, swathes of the nebula, whereas 30 cm telescopes and larger may reveal the dark pillars under good conditions. But a space telescope in orbit around the Earth, like Hubble — which boasts a 2.4-metre diameter mirror and state-of-the-art instruments — is required for an image as spectacular as this one. 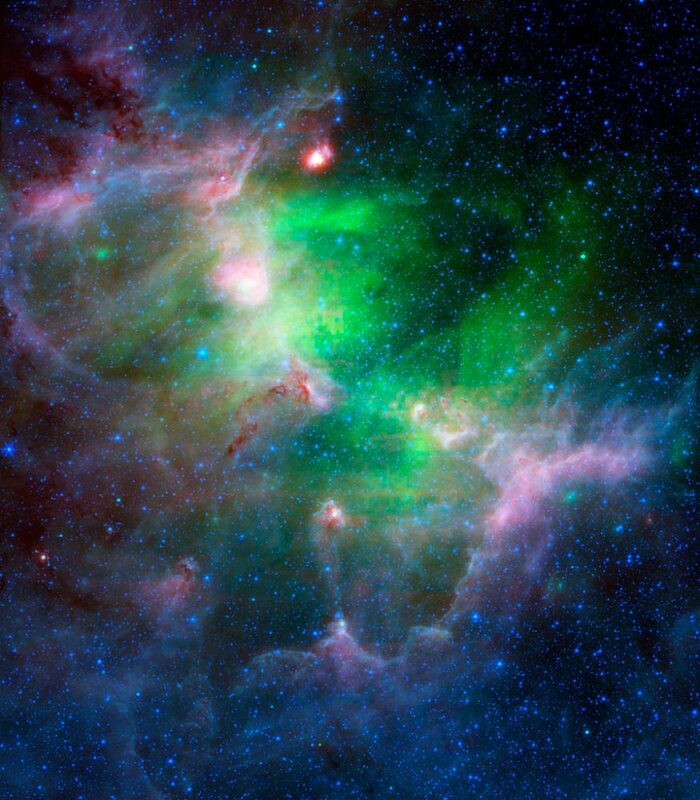 This majestic view taken by NASA’s Spitzer Space Telescope tells an untold story of life and death in the Eagle nebula, an industrious star-making factory located 7,000 light-years away in the Serpens constellation. 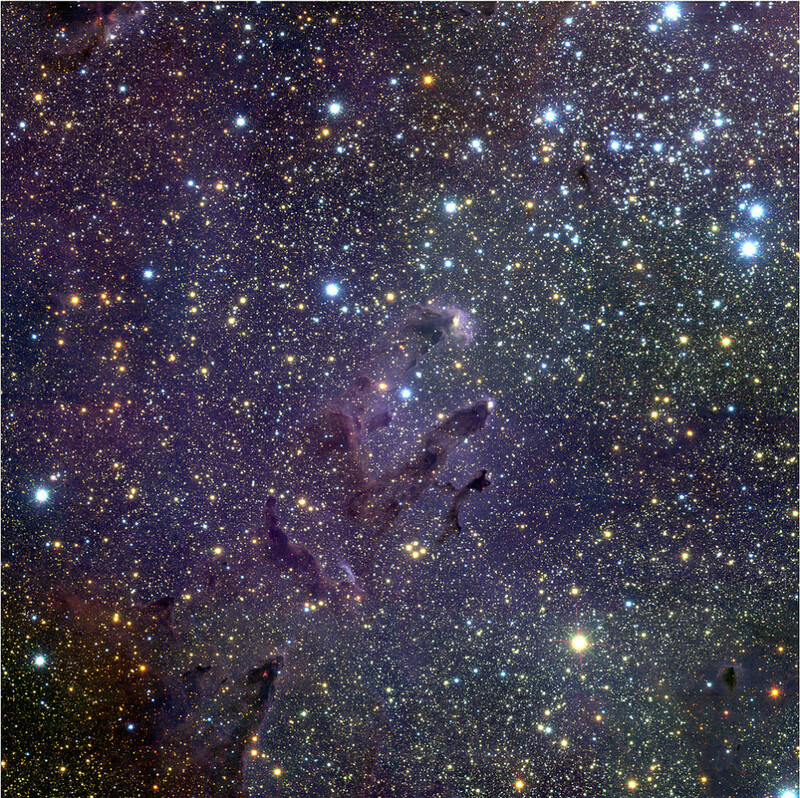 The image shows the region’s entire network of turbulent clouds and newborn stars in infrared light. 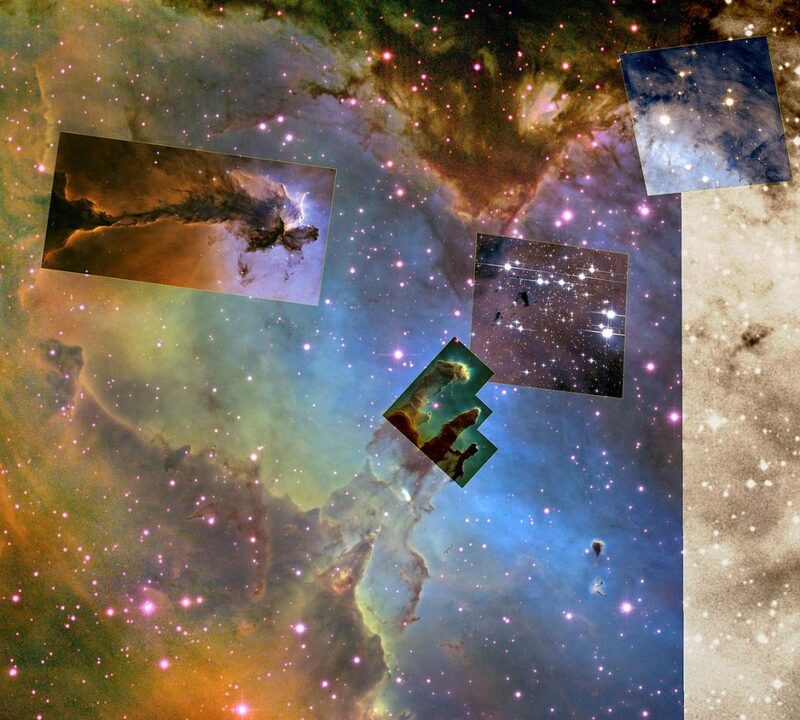 The color green denotes cooler towers and fields of dust, including the three famous space pillars, dubbed the “Pillars of Creation,” which were photographed by NASA’s Hubble Space Telescope in 1995. But it is the color red that speaks of the drama taking place in this region. Red represents hotter dust thought to have been warmed by the explosion of a massive star about 8,000 to 9,000 years ago. Since light from the Eagle nebula takes 7,000 years to reach us, this “supernova” explosion would have appeared as an oddly bright star in our skies about 1,000 to 2,000 years ago. Messier 16 (M16), also known as the Eagle Nebula, is located in the southern constellation of Serpens. A new look at the famous “Pillars of Creation” with NASA’s Chandra X-ray Observatory has allowed astronomers to peer inside the dark columns of gas and dust. This penetrating view of the central region of the Eagle Nebula reveals how much star formation is happening inside these iconic structures. The Chandra data shows bright X-ray sources in this field, most of which are young stars. In this image, red, green, and blue represent low, medium, and high energy X-rays. The Chandra data have been overlaid on the Hubble Space Telescope image to show the context of these X-ray data. Very few X-ray sources are found in the pillars themselves. This suggests that the Eagle Nebula may be past its star-forming prime, since young stars are usually bright X-ray sources. However, there are two X-ray objects found near the tips of the pillars. One is a young star about 4 or 5 times as massive as the Sun, visible as the blue source near the tip of the pillar on the left. The other is a lower mass star near the top of the other pillar that is so faint it is not visible in the composite image. The Chandra observations did not detect X-rays from any of the so-called evaporating gaseous globules, or EGGs. The EGGs are dense, compact pockets of interstellar gas where stars are believed to be forming. The lack of X-rays from these objects may mean that most of the EGGs do not contain enshrouded stars. However, infrared observations have shown that 11 of the 73 EGGs contain infant stellar objects and 4 of these are massive enough to form a star. The stars embedded in these 4 EGGs might be so young that they have not generated X-rays yet and one of them (E42) – estimated to have about the mass of the Sun – could represent one of the earliest stages of evolution of our nearest star. The Sun was likely born in a region like the Pillars of Creation. 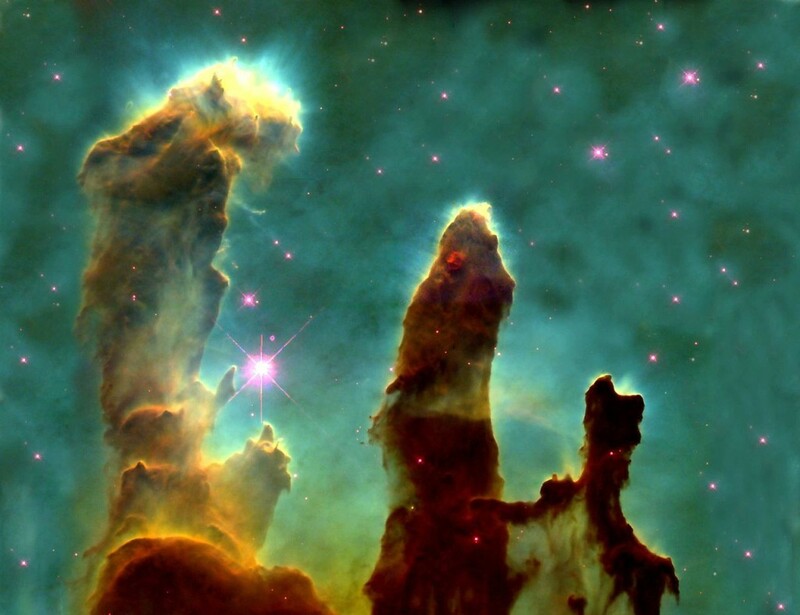 The pillars and the few stars forming inside them are the last vestiges of star formation in the Eagle Nebula, also known as M16, which peaked several million years earlier. This contrasts strongly with the active star forming regions in other clusters such as NGC 2024, where Chandra sees a dense cluster of embedded young stars. The results were published in the January 1st issue of The Astrophysical Journal and the research team, led by Jeffrey Linsky of the University of Colorado, includes Marc Gagne and Anna Mytyk (West Chester University), Mark McCaughrean (University of Exeter) and Morten Andersen (University of Arizona). X-ray: NASA/CXC/U.Colorado/Linsky et al. ; Optical: NASA/ESA/STScI/ASU/J.Hester & P.Scowen.